Junior Tally Book with two pockets. Your company imprint is on the front. Much like the original tally book but sized down. The sewn pad is inserted into the frosted pockets front and back. Not only for oil fields…cable companies, water and utilities, and transport services can benefit from having a tally book close at hand. Material: Vinyl, hard bound cover. 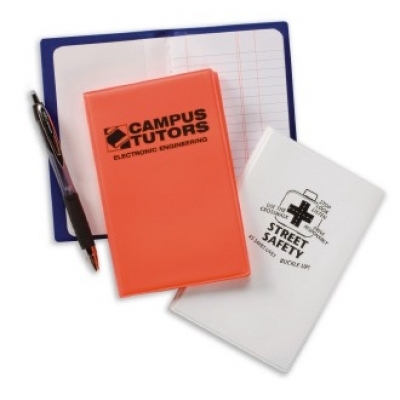 Price includes sewn paper pad, vinyl cover, with 1 color, 1 location hotstamp imprint on the outside front cover. Imprint size: For hot stamp imprint: Up to 10 square inches on the front. Option: Substitute the 100 page Water Resistant sewn Stone Pad, for more durability. Option: Clear Pen loop sealed into tally book for convenient insertion of pen. Located 1 inch down, inside front cover, or other locations per your request. Optional Insert (Shown in the 3 photographs above): Securely inserts into front or back cover and has 3 clear view insert pockets (6 views). Great for contact numbers, charts, and more. Advantage Advertising was easy to work with when setting up our customized template, and we were very pleased with the final product. We will order again when needing future products with our logo.